Leads in three of the four SHU/Hearst polls have been within the margin of error. 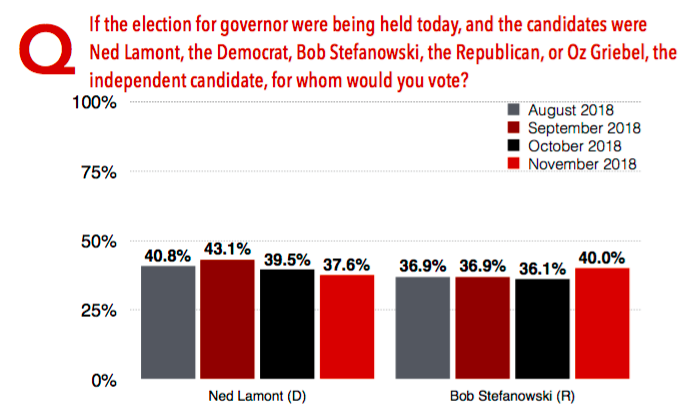 Women, younger voters and minorities favor Lamont, but the poll shows Stefanowski with a 2-1 lead among unaffiliated voters, a 10-point lead among voters aged 45 to 64 and a five-point lead among whites. The margin of error in the poll of 500 likely voters is plus or minus 4.32 points. It was conducted on Oct. 29, 30 and 31, sandwiched around the last of the gubernatorial debates on the 30th. The poll was the last of four by SHU/Hearst this year. A Quinnipiac University poll of likely voters released Tuesday showed Lamont with a four-point lead over Stefanowski. It, too, was within the margin of error.